28 April, 2018, Unceded Coast Salish Territories (Burnaby, BC) — Religious leaders and more than 100 members of diverse faith communities joined the protest against the expansion of the Kinder Morgan Trans Mountain Pipeline in Burnaby on Saturday, joining more than 200 people who have been arrested blocking Kinder Morgan’s Burnaby tank farm gates since March 10th. 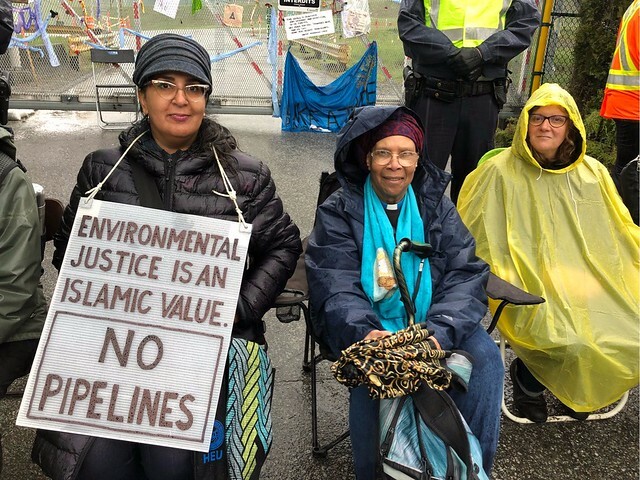 On Saturday in the pouring rain, faith and spirit leaders from Muslim, Buddhist, Jewish, Hindu, Unitarian, Christian, and interfaith communities gathered on Burnaby Mountain at Kwekwecnewtxw – the Watch House before marching to the front gates of Kinder Morgan’s Burnaby Mountain tank farm. There they peacefully sang, prayed, led ceremonies, hung prayer flags and rosaries at the gates and blocked access to the construction site.